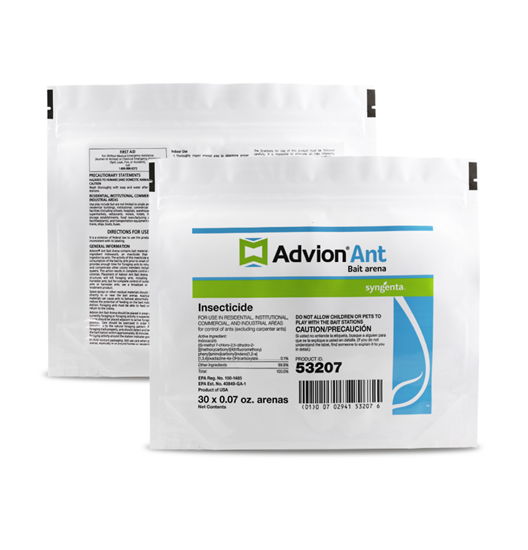 Advion Ant Bait Arena contain bait material with the active ingredient indoxacarb, an insecticide that acts through ingestion by ants. The activity of this insecticide allows adequate consumption of the bait by ants prior to onset of mortality. This provides enough time for foraging ants to return to nest sites and contaminate other colony members including larvae and queens. This action results in complete control of nuisance ant colonies. 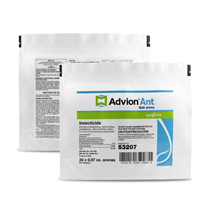 Placement of DuPont Advion Ant Bait Arena in and around structures will kill foraging ants, including fire ants and harvester ants, but for complete control of fire ants or harvester ants, use a broadcast or direct mound treatment product. Space sprays or other residual materials should not be applied directly to or near the bait arenas. Application of these materials can cause ants to behave abnormally and therefore reduce the potential of feeding on the bait material inside the station. Foraging ants must be able to feed on the bait and return to the colony. The bait's slow-acting poison provides enough time for foraging ants to return to nest sites and contaminate other colony members including larvae and queens, eventually destroying the entire colony.